Villasimius is one of the most popular tourist destinations in Sardinia. Its dozens of beaches have long been a preferred destination for tourists from all over the world. The beaches of Villasimius and its pristine waters are the true attractions of this town, located at the center of the Capo Carbonara promontory, boasting beaches both East and West. 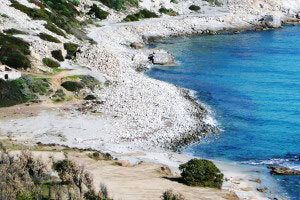 The creation of the Capo Carbonara Marine Protected Area is a further guarantee of a pristine and protected environment surrounding the beaches. Villasimius is perfect for those who want to make the best of their holidays. Restaurants, discos, night clubs, gelato shops, wine bars, and disco-pub make this town a perfect destination also for young people and singles looking for adventures. Characteristics: kiosk bar – beach umbrella and lounger rental – transparent waters – thin white sand – for families – for children – disabled access – paddle boat rental – wind surfing spot. Campulongu beach can be easily reached on foot from the S’Incantu Resort following a path surrounded by Mediterranean maquis, junipers and pine trees. The resort beach is the perfect destination for resort guests to enjoy sunny days. It is a long stretch of thin white sand and crystal clear waters. Characteristics: – limited access – kiosk bar – restaurant – beach umbrella rental – paddle boat rental. 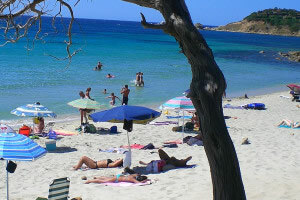 Punta Is Molentis beach is located about 7 km from Villasimius, driving North. The beach derives its name from the donkey, in Sardinian called “Su Molenti”, which was used to transport granite, of which there is still an abandoned mine. The shore features a mix of sand and cobble stones. Behind the beach, at the center of the hill, you can explore the ruins, almost hidden, of the Punta Molentis Nuraghe. The beach has a limited access during the summer to preserve the ecosystem. Characteristics: thin white sand – beach with services – shallow waters – surfing spot on the left side of the beach – for families – suitable for children. The continuation from Porto Giunco is a long stretch of sand called Simius. 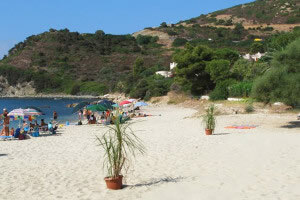 This is also the beach of the town of Villasimius, and therefore very crowded during the summer. Nonetheless, this is one of the most beautiful beaches in the area, especially in May, June, September and October. The sand is white and the water transparent. Characteristics: thin white sand – parking – surfing spot – kiosk bar – beach umbrella rental. Porto Giunco beach, also known as the beach of ‘two seas’, thanks to the salty environment of the Notteri pond that creates a double sea. Thin sand and a slowly deepening sea bottom make this beach one of the most suitable for families and children. The beach continues further right and, after a few rocks, it forms a small beach. This cove, Cala Giunco, is perfect for those who do not appreciate crowded beaches, and it is also a perfect surfing spot. 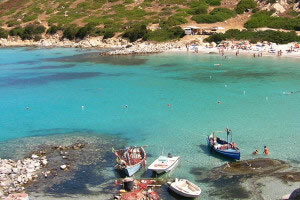 The beach derives its name from the old mine Cava Usai and is located on the East side of the Capo Carbonara promontory. After parking your car, the beach can be reached following the small paths that go down the hill. 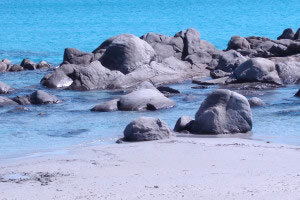 The beach has a mix of sand, granite, smooth stones and rocks that emerge from the sea. A truly captivating scenery, not too crowded, suitable for those who love pristine beaches. Characteristics: kiosk bar and showers – paid parking (6 euros) – nudists beach (far right side) – gay friendly beach (far right side) – thick sand – sheltered from the Mistral wind. 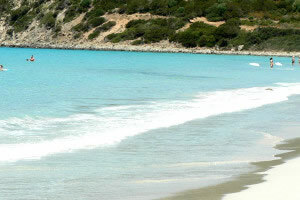 Porto Sa Ruxi is the first beach of Villasimius, sheltered from the Mistral wind. You will find it following the coastal road from Cagliari. This pristine scenery features sandy dunes and paths among mastic trees and beautiful junipers that take you down to the beach. The beach is a thin stretch of sand and rocks that emerge from the sea, dividing the beach into three small coves. Snorkeling and fishing among the rocks are just a few of the many activities you can do here in the summer. Characteristics: golden and gray colored sand – thin sand – suitable for children – little seaweed – restaurant by the beach “Il Miraggio” – umbrella and lounger rental – kiosk bar – parking. Campus beach is a gorgeous inlet of golden colored sand, where is also the outlet of the river Riu Foxi. 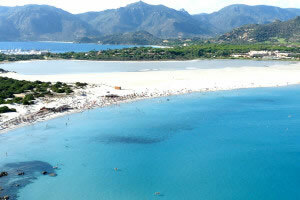 Full of reed and typical Sardinian vegetation, this beach is a spectacular location. The beach is dominated by the Phoenician site of Cuccureddus, which reminds us that already in the Phoenician era this site was a port for commerce and trade. There are three nuraghes to visit on the hill, a great way to mix swimming and exploring. Characteristics: no services – accessible only on foot/via the sea/by raft or paddle boat – transparent waters – thin white sand – a bit crowded with boats during the high season. Is Cuccureddus beach is a small slice of heaven, accessible only to a few. A small cove that you can reach on foot walking among the rocks, by raft or paddle boat or swimming from Campu Longu or Campus beach. The small excursion you’ll have to take, either by boat via the sea or crossing the surrounding maquis, will be rewarded with a small paradise reserved to those who venture into the exploration. A small beach of white sand, sheltered by the hills and encased by the rocks. Being a small sheltered cove, the adjacent sea may be full of boats and rafts. The Capo Carbonara Marine Protected Area stretches from the granite promontory of Capo Carbonara all the way to the Cavoli Island. The marine and land ecosystem inside the Park are of immense value to Sardinia. Visiting the protected area by boat will give you the opportunity to explore a paradise made of rocks, small islands, emerald waters, and bigger islands such as Cavoli Island and Serpentara Island. 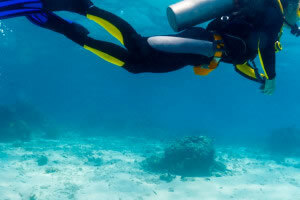 A park that has lately seen the appearance of a few tropical species such as barracudas and triggerfish. There are several tour options: by boat or raft for sea lovers, and on foot or by bike for those who want to explore the paths inside the Natural Park, between the Mediterranean maquis and breath-taking panoramas.